In just one week, the Pistons have seemingly done more work to their roster than they have in the past three years. Between making shrewd draft choices, trades and additions in free agency, Detroit has begun giving its frontcourt a major face-lift. Two days before the 2012 NBA Draft, the Pistons acquired swingman Corey Maggette from the Charlotte Bobcats in exchange for veteran guard Ben Gordon and a first-round draft pick. Then, for the third straight season, a player projected to be a top-five draft pick fell to the Pistons as center Andre Drummond of Connecticut slid to No. 9. Detroit ended the evening by selecting Texas A&M small forward Khris Middleton and Missouri shooting guard Kim English in the second round at Nos. 39 and 44, respectively. 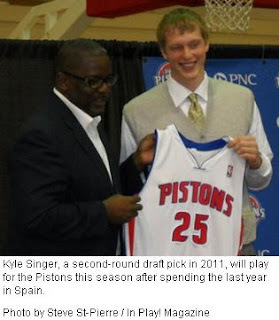 The Pistons have since also agreed to terms with 2011 second-round draft pick Kyle Singler, who spent last season playing in Spain, as well as free-agent Ukrainian center Vyacheslav Kravtsov. Both players are expected to officially sign contracts with the Pistons on July 11, when the NBA’s moratorium period ends and free agents can officially join teams. With the additions of Drummond and Kravtsov, the Pistons now have two legitimate centers, which means veteran Greg Monroe will likely play more minutes at power forward. Jason Maxiell, who started at power forward last season, had an option to opt out of his contract but has elected to play out the final season of his deal with Detroit. It’s possible Maxiell could remain the starter, with Monroe shifting between power forward and center as Drummond and Kravtsov enter games from the bench. Maggette, Singler and Middleton will join a crowded group at small forward that also includes starter Tayshaun Prince and reserves Jonas Jerebko and Austin Daye, though Jerebko and Singler can both swing over to power forward at times as well. The Pistons also have power forward Charlie Villanueva still under contract, though it’s possible the team could decide to waive him via the amnesty clause, eliminating his salary from their cap while still paying him in full. Currently, the Pistons have 15 players under contract when you include all five rookies: Drummond, Middleton, English, Singler and Kravtsov. Detroit also has three unrestricted free agents in Ben Wallace, Damien Wilkins and Vernon Macklin, who the team could have made a restricted free agent by making a qualifying offer but chose not to. Macklin will join the Pistons’ Summer League team in hopes of a roster spot opening or being signed by another team, while Wilkins will likely sign elsewhere. Wallace is expected to announce his retirement this summer. Detroit’s backcourt appears set with Brandon Knight and Rodney Stuckey remaining in the starting lineup. Veteran Will Bynum will continue as Knight’s backup at point guard while Maggette, Daye, Middleton and English could all see minutes at shooting guard behind Stuckey. In all likelihood, the Pistons will look to make at least one more roster move before the offseason ends. The team will likely look to trade Villanueva and Daye in order to free up a roster spot for either Macklin and/or a veteran guard to spell Knight or Stuckey in the backcourt. At least the Pistons’ main goals this offseason have already been achieved. They have acquired a couple of young, promising centers up front to team up with Monroe. They have created cap space by ridding themselves of the disappointing Gordon and replacing him with a better fit in Maggette, who is playing on an expiring contract. They also secured a deal with Singler, who had excelled in Spain and was said to be contemplating staying there. They won’t quite be the cream of the crop in the NBA’s Eastern Conference, but the Pistons have revitalized their roster. They’re even younger now than they’ve been, but they’ll be that much more entertaining in watching grow and develop into a potential contender.